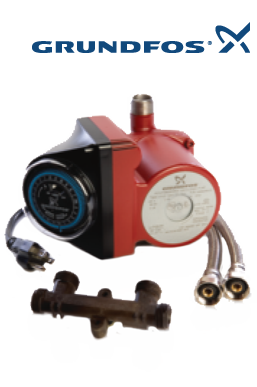 Save Time and Money with a Hot Water Recirculating Pump. Call or email Abacus today for a FREE evaluation. Abacus proudly serves the greater Houston area. When you turn on the hot water on your faucet or shower, first the hot water supply has to travel from the hot water heater to the fixture. After that, the water temperature only stays hot when in use. Once you shut off the hot water, it cools again in the pipes and the process starts over again the next time you use it. A Hot Water Recirculation pump is attached to the water through its supply line and recirculates the hot water from the heater to the fixture furthest from the source. This helps keep the temperature consistent and gives you instant hot water each time you need it. Pump: The System is installed on your hot water heater to help pull the water back to the heater so it can be reheated and put back into circulation. Pipes: Hot water is always present due to the continuous re circulation. Valve: This is placed under the sink that is farthest from the hot water heater and helps regulate the flow from the hot water line to the cold water line. In a typical new home (1 story / ~1,700 sq.ft. ), a hot water re circulation system typically costs less than $1,000, including parts and installation. Additionally, a Hot Water Re circulation Pump can save you an average of 12,000 to 38,000 gallons of water per year, while remaining very energy efficient. A water circulation system that eliminates cold water runoff at the faucet using a bypass valve and pump with a timer to control water flow. Why wait for hot water to arrive at the sink, when you can have it there instantly? Take away time spent waiting for hot water to flow and save gallons of water in the process. Certain areas now require low-flow showerheads, making this a perfect solution. Improve the efficiency of your home applicances (Washing Machines, Dishwashers, etc), by having hot water available instantly. Customize when you need to have hot water available the most, such as during mornings and evenings, using the built-in 24 hour programmable timer. Installation time is under two hours and can be performed easily by one of our certified technicians. The overall cost for an average home is around a few hundred dollars, including parts and installation. The pump features a wet rotor design for quiet, maintenance free operation. Corrosion resistance and durability features include a stainless steel rotor cladding and canister construction. This is an exclusive of the UP-15 series. Save energy and water with a low-watt, two-pole pump moter and low-flow performance. 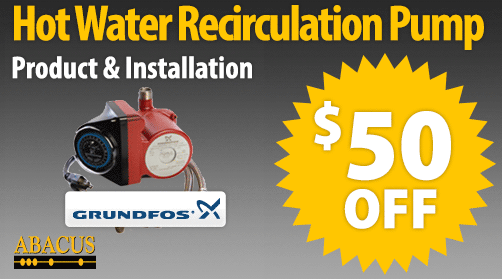 A GrundFos Hot Water Recirculation Pump can help you retain from 12,000 up to 38,000 gallons of water annually. In some communities, the installation of this device is now even becoming manadatory. Conserving water is reaching higher importance as our population increases. This is why we recommend a system that can help you save more and stay comfortable.